The 38 North feature a week ago identifying the first steps in what may be a program to dismantle key facilities at the Sohae Satellite Launching Station has received worldwide attention. “First steps” are the key words since there may be more to come. That’s certainly the case if the North Koreans are to truly claim that those facilities have been dismantled. What actions should the international community watch for in the weeks ahead? And more importantly, what would be the significance of the dismantlement of Sohae? On the first count, it’s a pretty straightforward technical assessment. The North Koreans still have to take a number of steps at the launch pad. First, while the roof and shell of the rail transfer structure meant to move rockets to the gantry tower have been removed, they are easily replaced, and were probably mostly intended to shield vehicles being processed from prying foreign eyes. Pyongyang will also need to remove the chassis and pad of the transporter. Otherwise, the North can still conduct launch operations on short notice. Second, dismantling the gantry tower itself as well as the fuel and oxidizer processing facilities nearby would be significant. Demolishing the gantry’s foundation—including the flame bucket—would be truly permanent. At the engine test stand, the North Koreans appear to have largely removed the test stand itself, which should prevent engine testing in the short to medium term, and the pace of the work suggests that they haven’t been extremely careful to preserve the components for rapid reconstruction. Once again, demolition of the foundation would make dismantlement of the site for all practical purposes irreversible. Critics have noted that all of these steps could be reversed. Indeed, it is conceivable that the North Koreans could demolish the whole Sohae launch facility and then turn around and rebuild it over a period of several years (it couldn’t be done in the blink of an eye) if they wanted to. Without a Roman-style destruction of Carthage (i.e., razing the place and plowing salt in the ground) of the site, there is no way of preventing the North from rebuilding or replacing anything it dismantles. But that gets to a larger point missed in the public analysis of the significance of what Pyongyang is doing. The standard line is that it doesn’t matter even if they dismantle the Sohae Satellite Launching Station, a facility that they spent a decade building at a cost of probably tens, if not hundreds, of millions of dollars. It doesn’t matter because North Korea has already developed an intercontinental ballistic missile (ICBM) and therefore doesn’t need to conduct any tests. First, rocket scientists would disagree with that assertion. They argue that the North’s tests conducted so far of the new liquid-fueled RD-250 engine for its ICBM have not been sufficient to establish a reliable manufacturing process. At this point, the North would almost certainly need to conduct a test firing of each engine as it is built to be confident it would work on a missile. So, if test activity at Sohae ends and the North doesn’t build another large-engine test stand elsewhere—which should be easy to detect—it will either have to cease its production of liquid-fueled ICBMs and intermediate-range missiles, or accept a very low level of reliability on any missiles that are built. That may not be an issue for maintaining a small, minimal deterrent, but would make it difficult either to “break out” of the current freeze with a large number of missile launches over a short period, or to deploy a highly credible ICBM force for more sophisticated strategies. All of the analysis misses another point critical in the past for getting rid of North Korea’s missile force. There is a long history here that has been virtually ignored or forgotten. 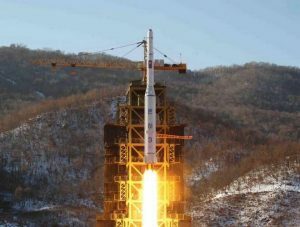 While Pyongyang has learned a great deal from its space launch vehicle (SLV) program to help develop an ICBM, whether you believe it or not, the fact is the North Koreans have also been serious about their space program. There is ample evidence to prove that. The interaction between the two has always given the North a loophole it could exploit by claiming its space program was entirely peaceful. That wasn’t so much of a problem in 2000 when, recognizing the potential danger ahead, the United States and North Korea discussed the possibility of the North abandoning its program and asking Russia to send Pyongyang’s satellites into space. But in its eight years in office, the Bush administration held no talks with the North on the program and the problem only got worse. By the Obama administration, the SLV/ICBM program had gathered momentum. Indeed, the 2012 Leap Day Deal—part of which was intended to stop missile testing—collapsed because the North went ahead with a space launch claiming it was peaceful and not covered by the deal. If the North completes the dismantlement of key facilities at Sohae that are currently underway, this could work toward closing the SLV loophole that could be exploited to circumvent a missile test ban. While the Tonghae launch facility on North Korea’s east coast is still capable of fulfilling this role, the site has been largely dormant for several years, with significant resources channeled into making Sohae the premier space launch facility. Closing Sohae, then, would be a clear signal that the North either intends to abandon its space launch program—a big if—or at the very least, may be willing to consider the kind of scheme discussed in 2000: working cooperatively with another country to launch its satellites. Both would be an important step in the right direction.